EDIT: None of this happened thanks to a computer crash, but it's hilarious enough that I'm not going to edit it all out. People are super eager to awaken the spirits, so let's do that! Jarolor you liar. But we pay the 15-cow price anyway. Let's see what happens! 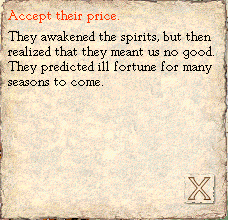 And this is why you listen to the clan mage with Renowned magic when he tells you that the spirits are no good. Or conduct a divination first, since the one or two magic points lost would be better than going 13 points into negative magic. Not only can we not use any magic in emergencies now, but since magic also acts as the clan luck stat, we're going to be unlucky as hell until we're back in the positives. 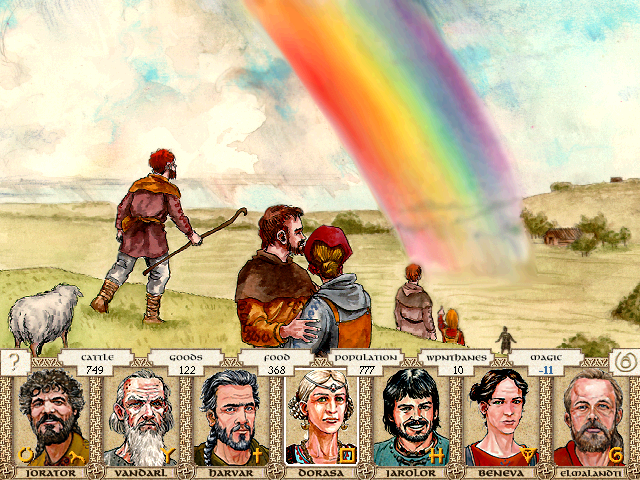 Carls of your clan are excited to see a rainbow touch down in one of your fields. As Orlanthi, you are Storm People, and there are few omens as positive as a rainbow, the beautiful gift left by the gods in the wake of a storm. It meant we were due for a time of good luck. Note that, as the rainbow is good luck, it increased our clan magic, but the previous event fucked us so hard that we're still negative. If we make an alliance with another clan, they will be more likely to gift us with a treasure. We must do something manly with this gift of luck. 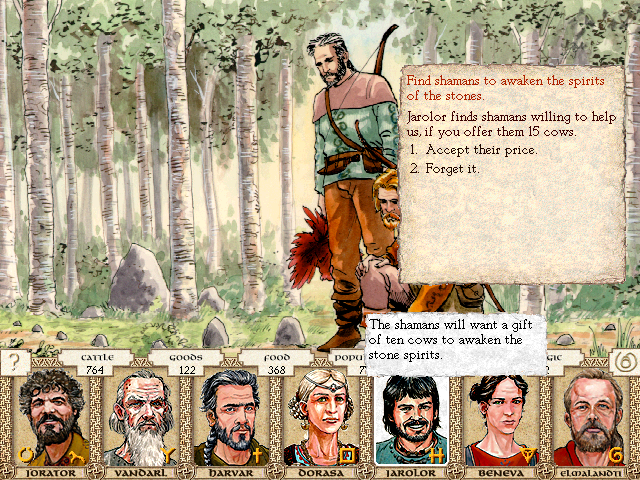 The clever trader knows when to seize on good luck, and turn it into silver and cows. Our clan magic has been weak for a long time. We should not squander the rainbow's blessing.